We are proud to congratulate our USAID implementing partner Fondo Unido Mexico (FUM) for their recent work with IBM’s Corporate Service Corps (CSC) experts to strengthen their community impact model and grow their position in the international development space. This most recent partnership with IBM represents yet another proactive step taken by FUM to grow as an organization and build on ongoing efforts by LINC to facilitate FUM’s learning and capacity development. Since LINC first partnered with FUM in 2015, FUM has continuously shown a strong drive to learn and improve. As a result, FUM has transformed into a learning organization, capable of strategically identifying areas for improvement and facilitating its own continuous development. In the true spirit of learning, FUM actively seek ways to invest in the “know-how” of their management teams and staff and improve their institutional systems, processes and procedures. FUM’s ability to manage, its own improvement process has allowed the organization to take significant steps towards strengthening and sustaining its own internal systems, policies, and programmatic capacities. As a result, FUM is well-positioned to assume leadership of the nation-wide civil society organization certificate training course (Diplomado de Fortalecimiento de Capacidades Directivas de Organizaciones de la Sociedad Civil) that we are partnering on under the USAID Local Capacity Development Activity. 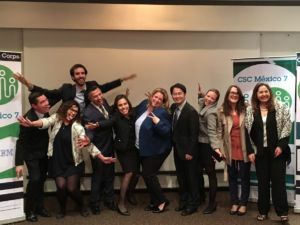 First launched pro bono in 2008 as part of IBM’s Corporate Social Responsibility initiative, the CSC aims to contribute innovative solutions to non-for-profits around the world working in communities facing critical, high priority development challenges. Earlier this year, the FUM management team collaborated with CSC experts in Mexico City to analyze and provide recommendations to strengthen and align FUM’s national and regional programs to ensure greater, sustainable community impact. With this recent additional support by IBM and the continued partnership with LINC, FUM is embracing a culture of learning, allowing the organization to achieve its vision of reaching and improving the lives of more Mexican citizens every day.